Avenged Sevenfold News: M.Shadows about Hail To The King: Deathbat: "We have the app down to about..."
M.Shadows about Hail To The King: Deathbat: "We have the app down to about..."
Hi guys. Is game gonna be available on Galaxy S3? 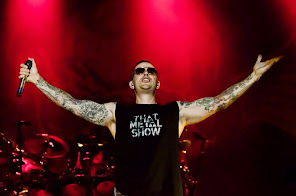 M.Shadows: Yes - A ton of time has gone into optimizing for the S3 and the iphone 4, ipod 5 and ipad 2. We have the app down to about 600mb. The only issue people could run into is if they have too much memory being used on their phone from other apps, etc. The s3 and iphone 4 use memory in a different way so while i know it works on both phones, I can't give you the specs on exactly how much space you would need to free up on each phone to make sure it works properly. I can say that while playing the game on the apple devices mentioned above that it is best to close all other applications before playing. Also turning off your phone before playing will also help with fragmented memory problems on the apple products. The fragmented memory will sometimes crash the loading of certain levels.